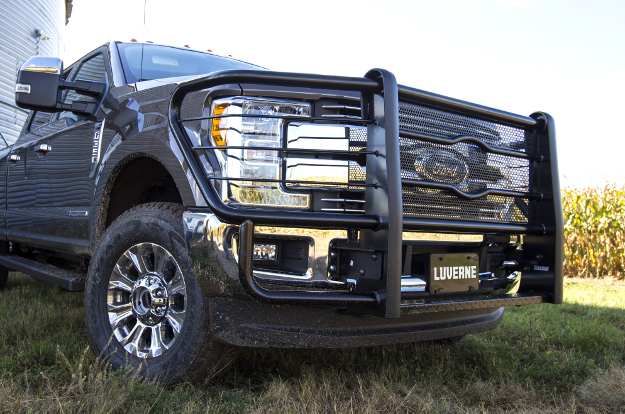 LUVERNE grille guards and bumpers are made to protect and add style to your truck. With features like our signature logo reveal, made-in-USA construction on most models and a vehicle-specific fit for each application, our front-end protection line has what you need to get the job done. 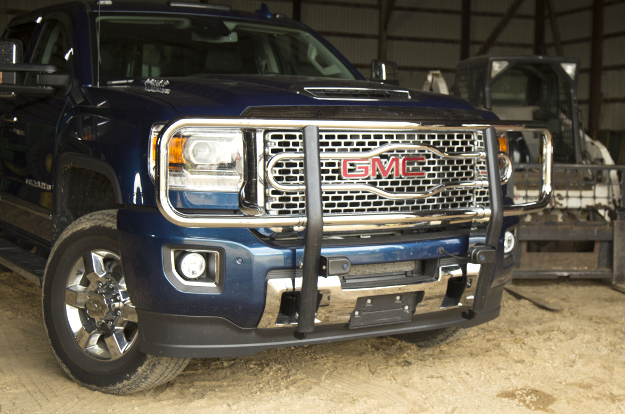 For pickup trucks on the farm or on the jobsite, our 2" tubular grille guards and Prowler Max™ grille guards are a popular choice, offering solid protection and professional style. The Prowler Max™ grille guard is a grille guard built for hardworking trucks. It offers unbeatable front-end protection with its one-piece design, punched steel screen, double-stacked brush guards, wire headlight cages and contoured logo reveal. The Prowler Max™ also adds functionality with its built-in 4" step and winch mounting platform option. This heavy-duty grille guard is available in polished stainless steel or black powder-coated steel. Baja Guard™ features a unique style to be the ideal offroad grille guard. It is designed with desert-racing-inspired style and features a strong, one-piece frame of 2" tubular steel for reliable front-end strength. The Baja Guard™ truck brush guard is shielded in a durable black powder coat finish for lasting rust resistance. It features three integrated light mounting tabs for LED lights, and select models come with built-in tow hook options. 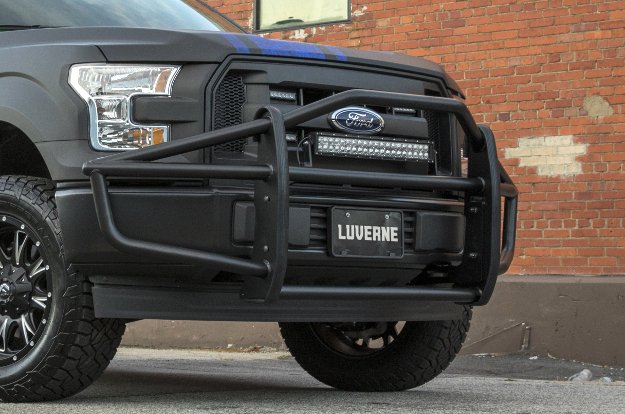 LUVERNE 2" tubular grille guards are a popular choice for work trucks and custom offroad builds. Each is equipped with our signature vehicle logo reveal to show off your truck's emblem and add extra protection for the grille. All LUVERNE 2" truck grille guards are proudly made in the USA and are constructed with 2" tubular steel for dependable strength. They are available in chrome or black powder coat, and each is designed for vehicle-specific installation. 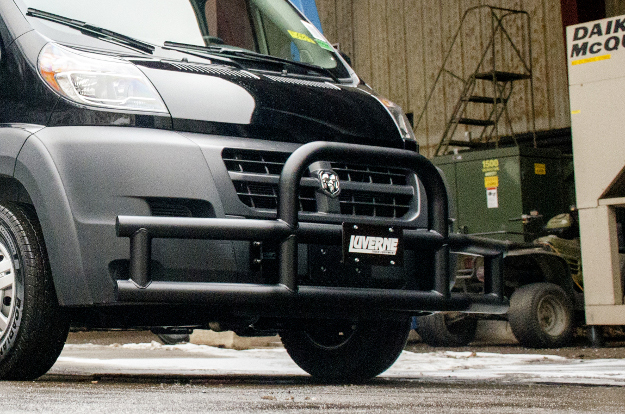 For commercial cargo vans, the Tuff Guard® is a must-have bumper guard for a professional look and reliable front-end protection. It is constructed with 3" stainless steel tubing, welded into a double-stack, single-piece design for ample strength. The stainless steel is also covered in a durable black powder coat finish for maximum rust resistance. The Tuff Guard® van grille guard installs with vehicle-specific brackets for an easy custom fit on each cargo van application. We also offer accessory mounting tabs for attaching LED lights or a license plate.